As your departure date approaches, you may be thinking about what to pack and whether or not to check a bag. Please take a minute to review our carry-on guidelines so that you know before you go and your trip gets off to a smooth start. Each traveler can bring on board one carry-on bag plus one personal item free of charge. To ensure a smooth boarding experience, it’s important to make sure that these items will fit into the overhead bin or under the seat in front of you. 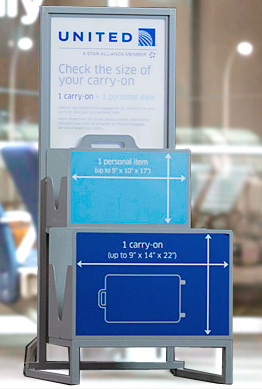 To determine if a bag will fit onboard, bag sizers will be available in the airport lobby. Once at the gate, any item in excess of the carry-on baggage size or allowance requirements will be checked to your final destination and may be subject to applicable service charges. Carry-on items that are acceptable to transport in the cabin but are fragile or bulky will be considered cabin-seat baggage. Customers can purchase a ticket for a cabin-seat baggage item so that it may be carried on board and transported in a seat. The Transportation Security Administration (TSA) allows each traveler to carry on liquids, gels and aerosols in containers of 3.4 ounces (100 mL) or less, inside a single quart-size (liter-size) clear, sealable bag. As of January 31, 2014, passengers traveling internationally into the U.S. and connecting to another flight are allowed to have in their carry-on baggage liquids in excess of 3.4 ounces (100 mL) that were purchased as duty-free merchandise. This only applies to products purchased in duty-free stores, placed in an intact designated secure, tamper-evident bag, and successfully screened and cleared by TSA officers. Scanning may not be effective for liquids in opaque, ceramic, or metallic bottles, or other containers. Liquids that cannot be screened and cleared will not be allowed to remain in carry-on baggage. Customers may choose to place these items into checked baggage or throw them away. For more details about liquids in carry-on and for other carry-on baggage rules relating to TSA screenings, visit our TSA Security Checkpoint Guidelines page. To determine first and second checked baggage service charges for your itinerary, use the baggage calculator at www.united.com – baggage service charges. Please note that as required by U.S. Department of Transportation regulations, baggage service charges for your entire itinerary are determined by the marketing carrier for the first segment of your itinerary. Your originating marketing carrier is the airline whose flight number is assigned to the first segment of your itinerary. If this carrier is not United or United Express, different charges may apply. Baggage service charges are based on the date of ticketing. Checked baggage service charges apply at any point where bags are checked. For a trip that includes one or more connections, bags will be checked to your final destination, and the charge for checking a bag from your origin to your destination will apply. For a trip that includes a voluntary stopover, your bags will be checked to your stopover point, where you will collect your bags. When you resume travel, subject to applicable charges, you may check your bags again from the new point of check-in to the destination. Temporary or permanent baggage embargoes, based on size, weight or number of bags, may be in place at certain airports. See our Excess Baggage Embargo page for details. Some customers are exempt from certain checked baggage service charges for bags within specified size and weight limits. For specific exemption details relating to your itinerary, select the appropriate status or membership from the dropdown list in the baggage calculator above. Note that exemptions cannot be combined to provide waived charges for additional bags. In the case of multiple exemptions, the greater of the allowances will apply. These benefits apply only on United- and United Express-operated flights when baggage check-in occurs with United. Active U.S. military personnel and their accompanying dependents, not traveling on official business, receive waived service charges for up to three checked bags. Active U.S. military personnel and their dependents traveling in United Economy on official business receive waived service charges for up to four checked bags. Active U.S. military personnel and their dependents traveling in United Global FirstSM, United BusinessFirst®, United First® or United Business® on official business receive waived service charges for up to five checked bags. If you plan to check additional baggage, or baggage that is over the listed size and weight limits, please review United’s Excess Baggage policy for further details. Baggage acceptance policies may vary throughout your itinerary based on the airline operating the flight. For flight segments operated by carriers other than United or United Express, please refer to that airline’s policies. For links to United partner airlines’ websites, please view the Changed Bag Rules and Optional Services page. View baggage policy frequently asked questions. Check-in is available starting 24 hours before your scheduled departure. Required timing for check-in, baggage check and boarding may vary based on your departure airport and destination. See our Check-in and Airport Processing Times page for details. If the above time limitations are not met, United can refuse to check baggage without a signed release of liability from the passenger. Baggage will be checked to a customer’s final destination or to a permissible stopover for the fare paid. Customers making connections which involve an overnight stay must claim baggage at the intermediate point and re-check baggage for the connecting flight on the following day. Customers traveling to the U.S., China (except Beijing) and India, who are connecting to a domestic flight within any of those countries or to another international destination, must claim their luggage upon their arrival to the first port of entry and re-check it with the connecting airline. Excess valuation may be purchased at the one-way rate of $1 per $100 of higher declared value than United’s maximum limitation of liability. United Airlines does not provide insurance for checked or unchecked baggage. United will accept baggage with a declared value up to $5,000 provided the item is properly described, properly packaged and undamaged. to your point of transfer to another carrier. You must re-declare and pay the applicable charges each time you check your excess valuation baggage. United does not offer excess valuation on fragile and perishable items. Also, United does not offer excess valuation on most items of sports equipment. For more information regarding baggage delivery, damaged, delayed, or lost baggage, excess baggage, etc please visit united.com.